Our industrial world is based on the division of labour and thus requires a high degree of mobility. This mobility can only be assured in future times, if traffic noise, which results from this mobility and is the number one complaint of the general public, will be reduced drastically. Projected growths in road traffic imply a worsening of this problem. Figure 1 shows the distribution of the different noise sources to which the general public in Vienna is exposed. As was already shown in other studies it becomes obvious that traffic is definitely the major noise pollution source. Intensive research and development efforts reducing the noise of the road traffic are an absolute necessity. Today the pass-by noise of newly registered passenger cars in most of the driving conditions is mainly determined by the noise, which derives from the interaction between road surface and tyres. The tyre noise of a truck dominates exterior noise at higher constant vehicle speed, as it is driven on transit roads. For this reason it is necessary to reduce the tyre noise to decrease the noise nuisance of the population. Preliminary examinations have demonstrated, that the behaviour of the pavement referring to the tyre noise might be different for passenger car tyres and the tyres of trucks. A road surface for low tyre noise of trucks might be different to pavement for low passenger car tyre noise. However, intensive research and development efforts are needed if acoustic optimisation of the interaction between the road surface, vehicle and tyres is to be achieved. The research project "Low-noise Road" will bring together three international research teams in the fields of road surfaces, tyres, and vehicles. It shall be proved that it is possible to develop both the "70 dB-passenger car" combined with a suitable road surface as well as extremely low-noise trucks; in the long run trucks should have the same noise emissions as passenger cars. If these projects can be realised, it should be possible to reduce the noise pollution, to which the population is exposed by half. An exterior-noise measuring track provided with 6 different surface types was set up at a closed testing area. The surface types being used are standardised ISO-reference surface ISO 8, porous asphalt PA11, noise-reducing bituminous-layer surface BLS 8, stone-mastic asphalt SMA 11, exposed aggregate concrete surface ECS and a surface treatment on concrete STC. Every test track is equipped with a measurement place which meets the standard ISO 362 (with the exception of surface specifications). The lay out of the different test tracks on the testing ground is shown in Figure 2. Noise-reducing porous asphalt represents a well-known measure for the reduction of traffic noise, which is caused by the interaction between tyres and surface. This surface is standardised in Austria according to regulation (RVS) 8.06.28, (obligatory according to reg. ZI. 801.108/7-VI/1/90, BMfwA/Federal Ministry for Economic Matters). Although this regulation was drawn up with regard to the latest technical developments in the field of road construction, one did not take into account the influence of the interaction between tyres and surface on the exterior noise. Optimisations from this title are still to be carried out for both components. It seems that a noise measurement, which is carried out according to the statutory measuring methods (near field level of a test tyre at the towing dynamometer) and which takes into account both the subjective human perception as well as objective points of view concerning the respective surfaces has still to be developed. Only by using the new test tracks the open questions will be answered. Porous asphalt PA 11. Design defined in Austria according to RVS 8.06.28, (obligatory according to ZI.801.108/7-VI/1/90, BMfwA (Federal Ministry for Economic Matters)). Because of the high cavity, which is formed by connected pores, rainfall can enter into the road surface and is divert. For this reason the danger of aquaplaning and the constituting spray fog is decreased. noise-reducing bituminous-layer surface BLS 8. They are being used for maintenance purposes and among other things they serve for increasing the skid resistance. Stone-mastic asphalt SMA 11. A dense, relatively rough surface, which has been used for highways lately and is supposed to reduce noise emissions. SMA 11 distinguish itself because of its high resistance against deformation. Exposed aggregate concrete: is successfully used for the construction of motorways. Its effectiveness can be explained in the same way as that of the SMA 11 surface. Surface treatment concrete STC, is being used for maintenance purposes. It serves primary for the increase of the skid resistance. By a favourable design of the surface the tyre noise can be cut down. Apart from the noise problem one also has to pay attention to safety features such as water drainage and luminosity of the road surface. Both a standard-size car and a heavy-duty truck, classified according to the exhaust regulation EURO II and provided by Steyr Commercial Vehicles were used as reference vehicles. Both vehicles are model year 1994 and comply with the latest technical developments. The passenger car reference vehicle is a Volkswagen Golf Europe, equipped with a 1,8l SI engine and a maximum engine output of 66 kW. The noise is being measured simultaneously on both sides of the vehicle by means of two manually operated sound-level meters. The microphones are installed according to the respective standards, that is in the middle of the measuring place, 1.2 m high and 7.5 m away from the roadway centre line. After a real-time digitalisation the sound signals are completely recorded by a portable computer, which is located a the measuring place. Thus a data analysis can be carried out at a later point of time. By using one identical set of data different analyses such as narrow band-, half-tone-, third- and octave analyses can be carried out. The lay out of the measuring devices is shown in Figure 3. By means of a telemetry system the data of all measured variables mentioned above are transferred to the central computer of the measuring place. Here these data as well as the sound signals are stored simultaneously. The measured variables are shown in Figure 4. Figure 4: Test vehicle with measured variables. A depiction of all measured data - including the LIN- and A-level of the pass-by noise dependent on the mileage. It is possible to carry out a sound analysis anywhere on the measuring track. This sound analysis includes narrow-band-, half-tone-, third- and octave-analysis and is carried out by means of a FFT-computation. The data are further processed by using a psycho-acoustic workstation as well as standard analysis programs. The original data are stored by means of the CD-ROM system. The tyre noise of light weight and experimental tyres with varying combinations of running treads, different tyre profiles should be studied on the different pavements. The behaviour of the pavement referring to the tyre noise of passenger car tyre and the tyres of trucks shall be investigated. The measuring techniques determines the influence of various parameters on the pass-by noise level and noise frequency spectra, e.g. the slip between the road surface and the tyres, drive torque, and the temperature of tyres and surfaces. Develpment of NEW defined Low-noise truck and car. Development of low-noise road pavements with surfaces for highly frequented roads as well for urban areas. Development of low-noise tyres, which are adjusted optimally to open (porous asphalt) and dense wearing courses. 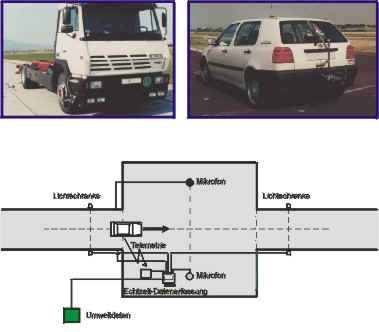 It has to be proved that it is possible to develop the extremely low-noise "70 dB(A) passenger car" combined with a suitable road pavement and that the development of extremely low-noise trucks is also feasible; in the long run trucks will not be significantly noisier than passenger cars. Thus the noise pollution to which the population is exposed shall be reduced by half. Traffic has to be accepted in a more pronounced way by the population by means of a significant reduction of the future exterior noise limit value which is currently 74 dB. The final figures 5 and 6 for car and truck point out how the outside noise level can be reduced for a today's vehicle collective. White vehicles, tyres or road surfaces announce the low-noise type. As an important result can be stated that a bisection of the outside noise level can be reached by a combination of the measures worked out.